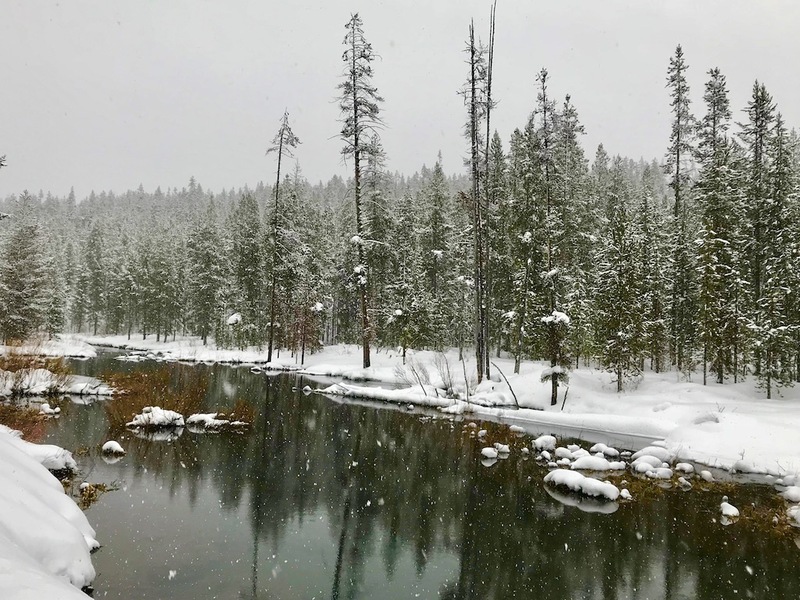 We had the pleasure of discovering the winter in Yellowstone National Park and Montana courtesy of Yellowstone Country, Montana. All thoughts shared are our own opinions and reflect our experiences during our travels. Vacationing in the winter. A lot of people think sun, beaches and warm weather destinations. These can provide a lovely respite for folks who live in the North American snow belt or other cold weather spots. 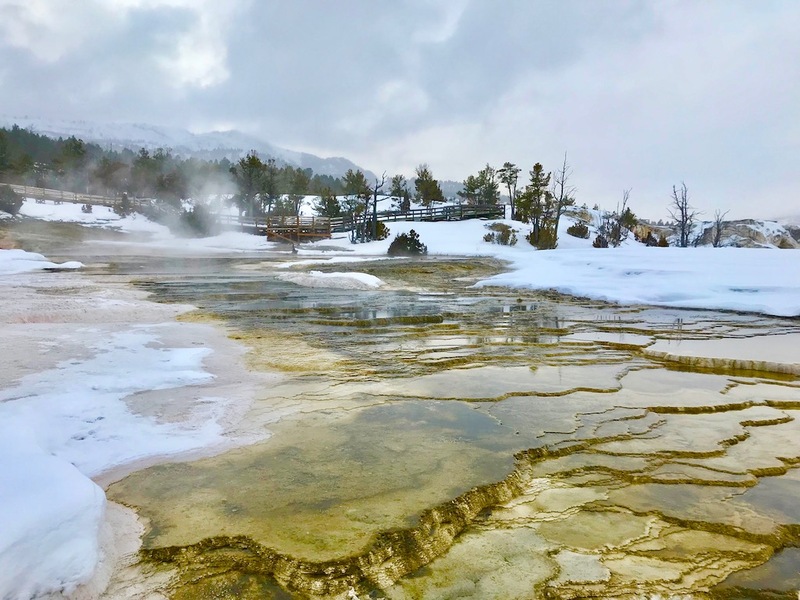 If you’re like us and don’t really mind putting on your layers and enjoying the colder weather, Yellowstone Country is a wonderful spot for you to consider exploring. 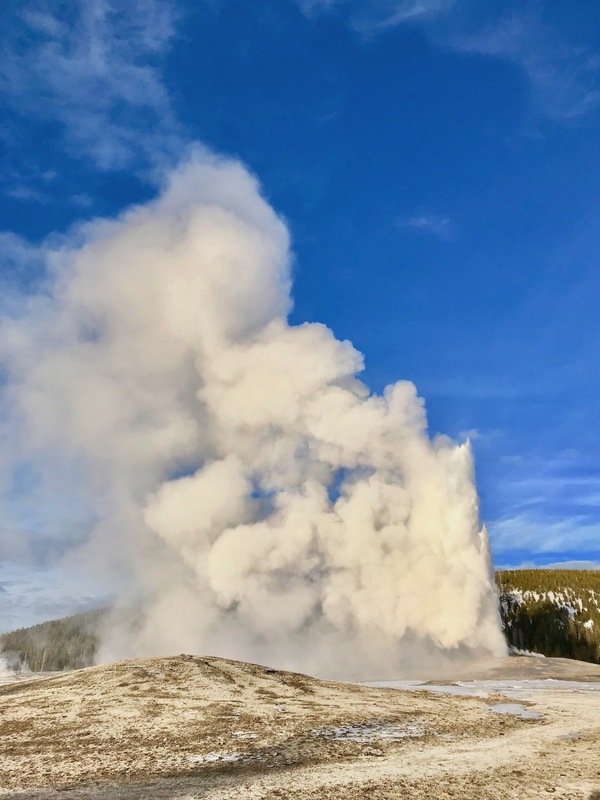 If you’ve read any of our stories on our summer visits to Yellowstone National Park you know that it’s a must-visit destination. America’s first national park is one that can be visited endlessly. We’ve met folks who live nearby the park and say that every time they visit they see or learn something new. 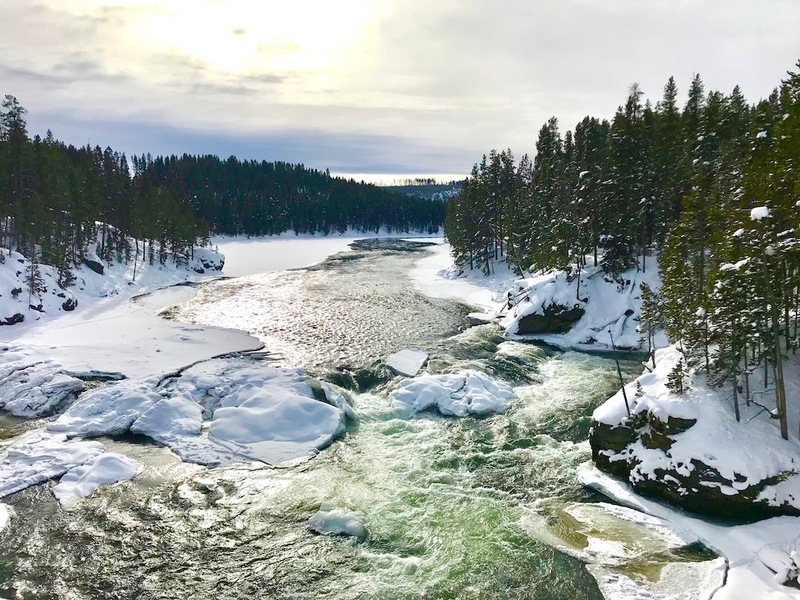 Warning: this post is about the beauty of a winter visit to Yellowstone Country. We’ll save all the delicious food and drinks we experienced for another post. Don’t worry there was plenty of it! The beauty of the park is enhanced not only by the pristine snow and ice but also by the fact that there are no crowds. No lines. No waiting. For someone like me who really tries to limit the amount of time I spend around lots of people this is the perfect time to visit. I visited the iconic Old Faithful geyser in summer and shared the experience with several hundred if not a thousand people. During this visit, we shared an eruption at Old Faithful with just a handful of people and a rogue coyote. 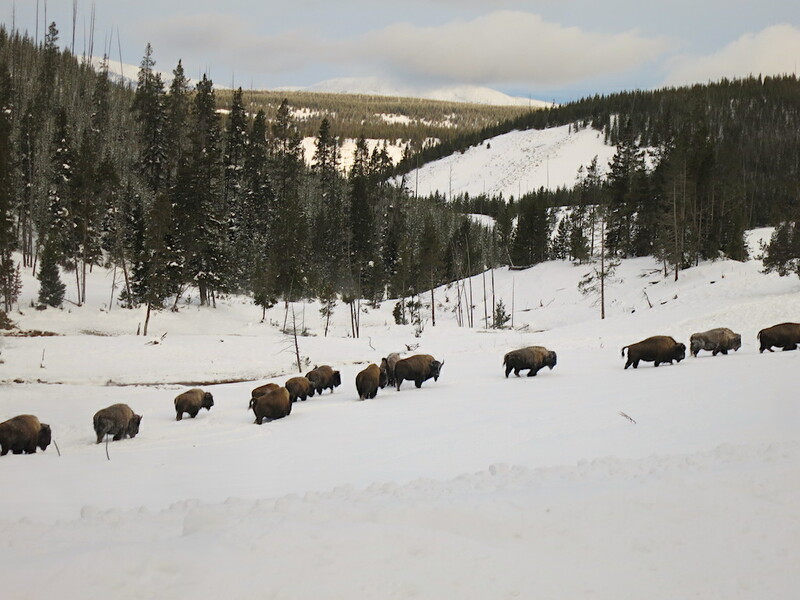 Here’s just a glimpse of our winter visit through Yellowstone National Park. 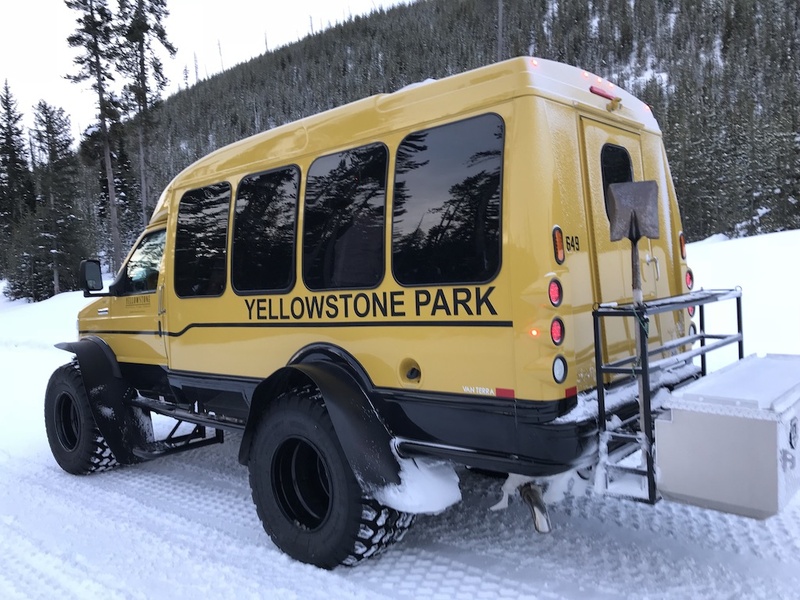 While visiting Yellowstone Country in the winter you will find many different types of snow coaches and can easily arrange a charter. These vehicles make it possible for visitors to get inside and around the park easily and safely. The park’s new snow coaches use huge squishy tires for the smoothest ride ever. Their large windows make it possible for you to see everything and get great pictures without getting out of the vehicle. Adventure travelers, don’t worry. There are plenty of stops along the way for short or long hikes into the park to see many highlights. 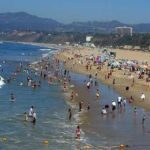 You can arrange for the type of visit you are comfortable with and will most enjoy. The outdoor activities that are available are vast and can be customized for your level of expertise. While we were there we enjoyed snowshoeing, snowmobiling and dog sledding. Downhill and cross-country skiing also abound in the area. If you enjoy dogs don’t miss a chance to go dog sledding. The dogs are so excited to go and it’s fun to watch them getting ready. They bark like crazy with anticipation of the run but they are quiet and serious on the ride itself. It’s comfortable and a great way to get into the deeper woodland areas to enjoy the beautiful scenery. The company that hosted us was Spirit of the North Adventures. 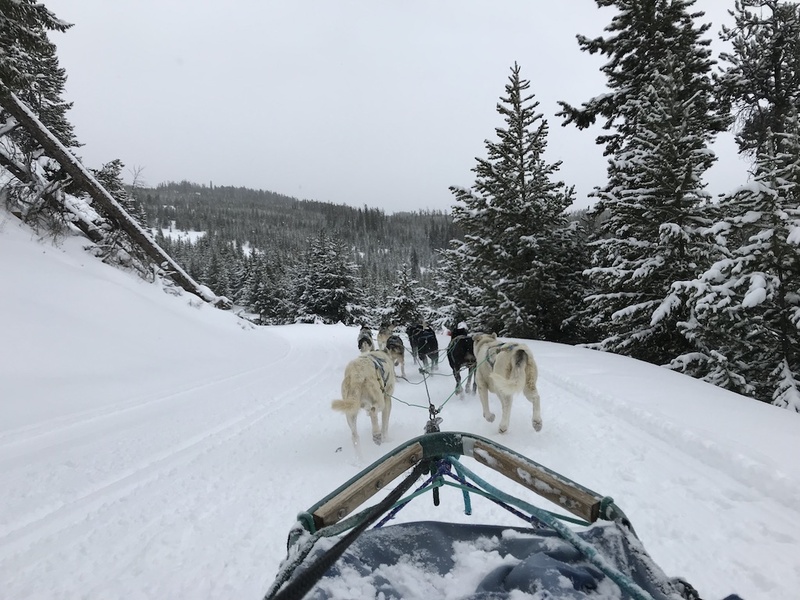 They work with rescued Alaskan Huskies and even offer you a chance to drive your own sled with instruction. We found all the instructors and drivers to be great lovers of the dogs and really good teachers. 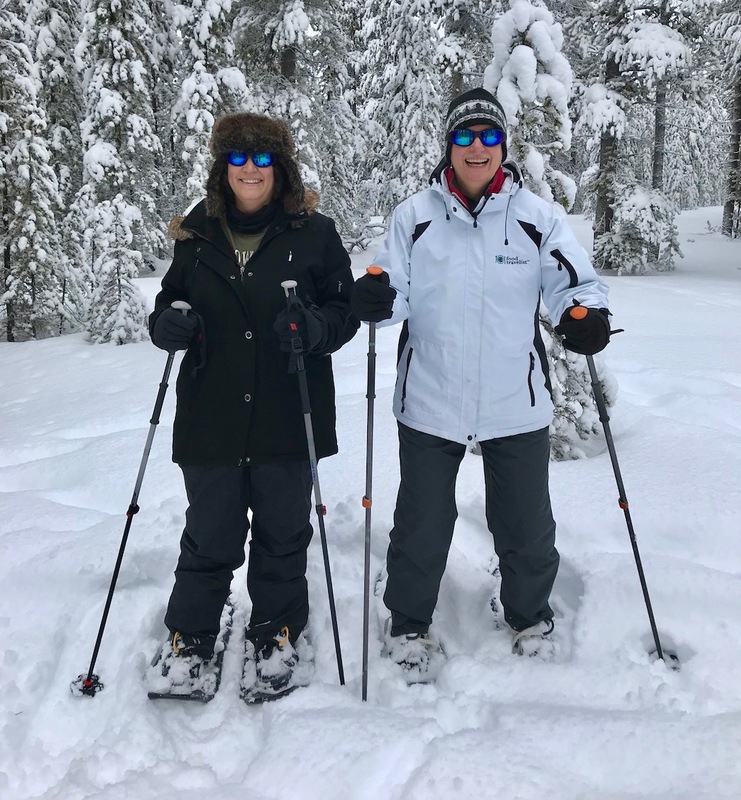 Another way to enjoy the quiet of the winter woods is snowshoeing. This was our first time and we loved it! Walking around in the woods at your own speed and taking it all in was spectacular. I’ll tell you it’s really very easy and not much different than regular walking. The shoes and the poles help you balance and make your way through the snow. You can go at your own pace and really find the peace in nature. It’s quite an amazing experience and one we never expected to enjoy so much. For those who have the need for speed (not me) snowmobiling will be your winter transportation of choice. Zooming through the woods will definitely get your adrenaline going. 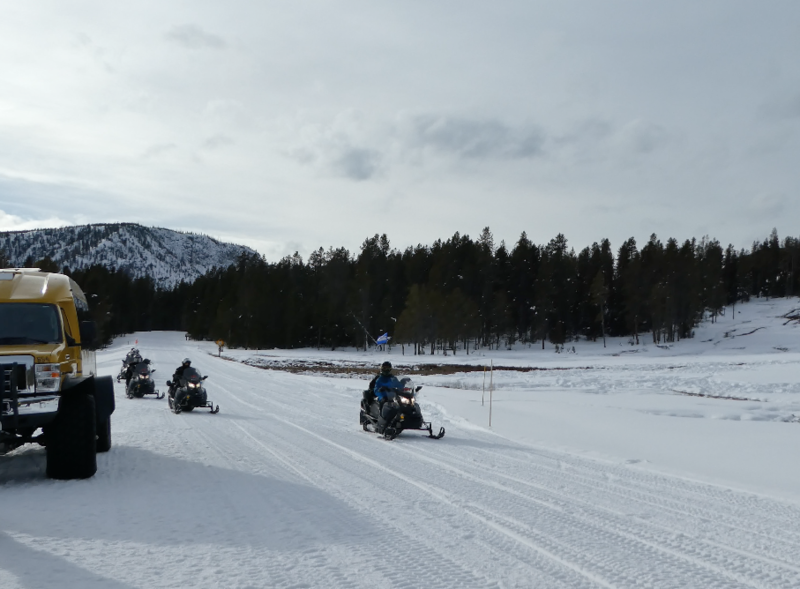 We snowmobiled in West Yellowstone and it is something quite different. We love nature and especially enjoy seeing the animals in their natural habitat. You may not get the chance to see the bears, who are hibernating in winter, but you will get a chance to see herds of bison in their element. One day we saw close to 200 bison on our journey through the park (Diana was counting). At the beginning of our trip, we were blessed to see big horned sheep grazing along the side of the road. 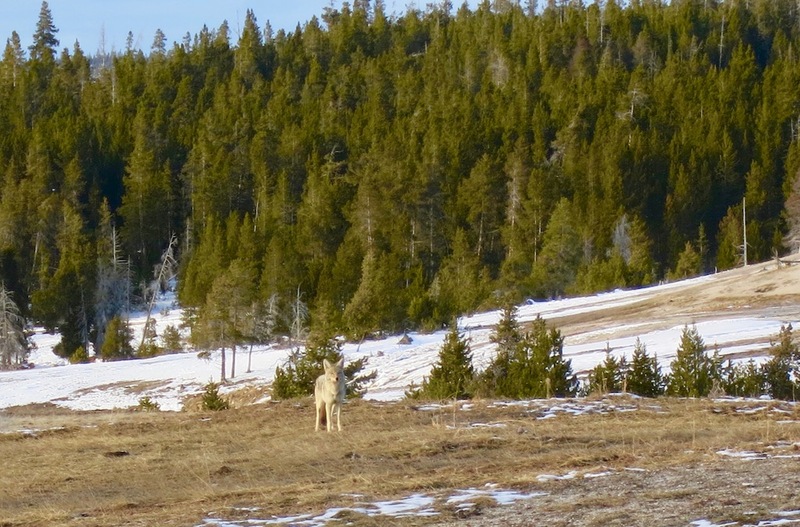 Throughout our visit, we saw bison, elk, sheep, coyotes, wolves, muskrat, deer and fox. Many birds also were on full display swans, ducks, geese, a bald eagle and even a blue heron. 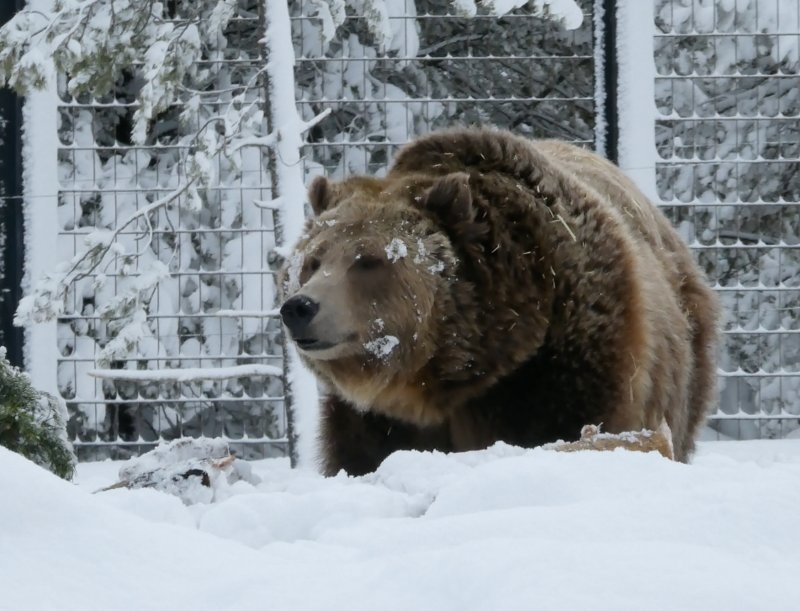 While you may not get to experience bears in the wild during winter in Yellowstone you can see them at the Grizzly & Wolf Discovery Center in West Yellowstone. Open all year this not-for-profit center is a wildlife park and educational facility. What we liked best about the center is that all the animals have been rescued and would otherwise not have survived without the help of the center. 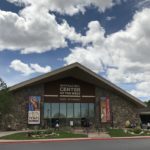 Take the time to not only visit the animals but also to watch the films, learn about all the conservation research they do and see the exhibits. They have a wonderful gift shop and all proceeds go directly to the care of the animals and maintenance of the center. One of the best things to do in winter is snuggle and get cozy. 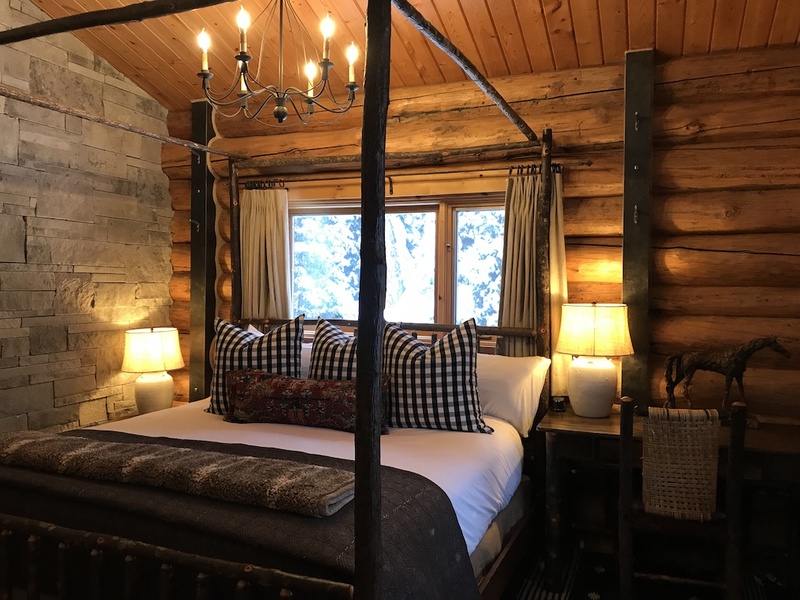 Once you’ve spent the day enjoying all that nature has to offer outside, head to a luxurious cabin or resort for all the creature comforts you desire. Whether you prefer spa treatments, culinary feasts, wine tastings or all that and more, there are many, many options from which to choose. 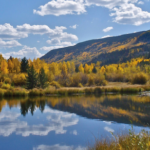 One of our favorite stops was our returan to Lone Mountain Ranch. They offer over 85 kilometers of groomed woodland cross-country ski trails and 30 km of snowshoe trails on the ranch. They also host sleigh ride dinners in their lantern-lit cabin with live music and a delicious prime rib dinner. During the sleigh ride back to your cabin be sure you look up. You won’t want to miss the magical sparkling stars in the clear night sky. 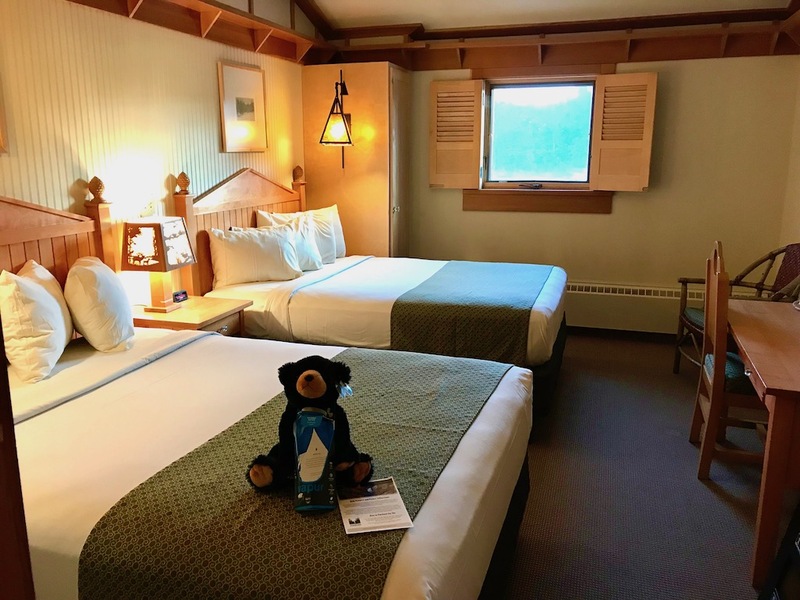 You can also stay in Yellowstone National Park at the Old Faithful Snow Lodge or the Mammoth Hot Springs Hotel. Both are full-service properties and provide unique and very comfortable stays in the park complete with food service and amenities. 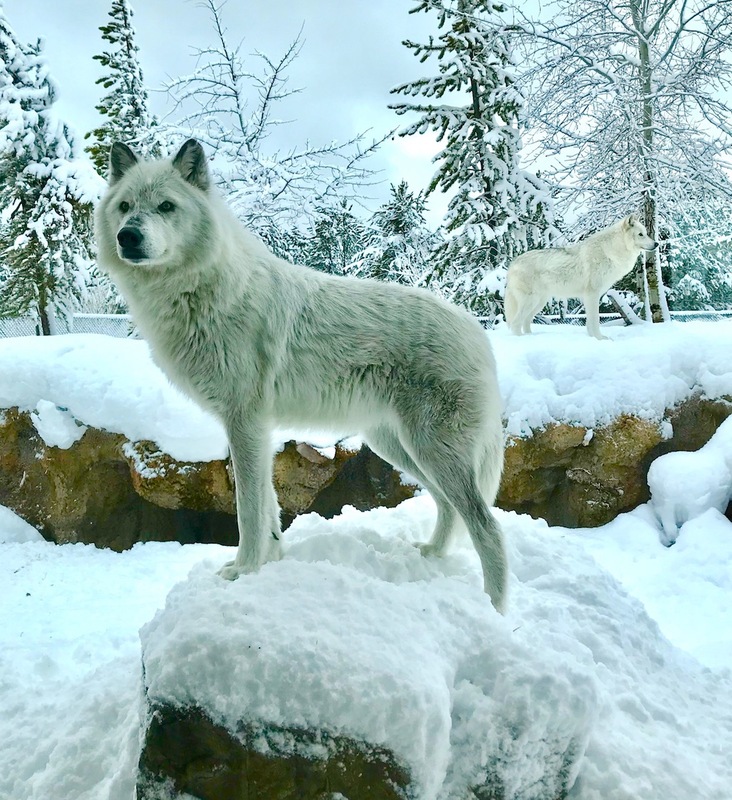 We highly recommend a visit to Yellowstone Country in winter but there are things you do need to keep in mind before making your reservations. Be prepared. You’ll need to wear several layers of clothing to keep yourself warm and comfortable all day long. From a thin starter layer to a top waterproof layer to stay dry. We live in Chicago and didn’t need to buy any special clothing that we don’t use here. But if you live in a warmer climate you may need to invest in some key clothing and boot items. Warm dry feet and hands are essential to enjoying the outdoors. If you’re going to be out for extended periods of time, purchasing hand and feet warmer inserts are a great way to go. Stay hydrated. Although there’s tons of snow around the climate is oddly dry. Be sure to take water with you wherever you go. Most places have water bottle filling stations, which we love, so bring a water bottle with you. Plan Extra Time. Winter weather in Yellowstone Country can be unpredictable. When driving leave plenty of time for safe driving. It also takes time to put on (and take off) all those extra clothes so pit stops take longer than you’d expect. Watch Your Step. Footwear is key to safely exploring the park. Be sure you have great winter hiking boots that provide a good grip. Again, extra time and moving slowly and walking like a penguin helps keep you safe and sound. The park is partially open. Don’t go expecting to see the entire park. Due to the amount of snow in Montana and Wyoming only certain parts and roads are open in winter. Be sure to check with the Yellowstone National Park website for updates and closures. 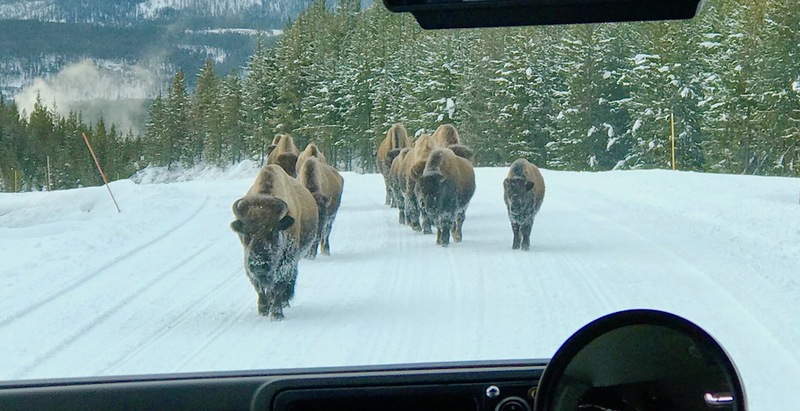 None of these things should stop you from going to Yellowstone in the winter. They are just things to be aware of and help you with your planning. Visiting the national parks in America is a wonderful way to see our country and an even better way to meet people from all over of the country. 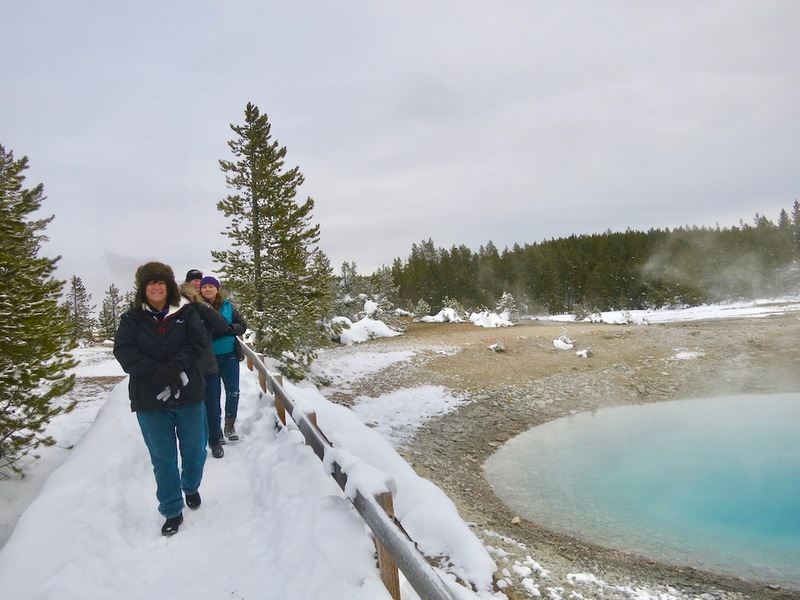 We have now been to Yellowstone Country in the summer and the winter. Both trips have produced some of our most treasured and cherished travel memories. Although we love the beauty and nature of Yellowstone Country the people are what really make it special. They clearly adore their national treasure and work hard to protect it for future generations to enjoy. We thank them for their service and for caring enough to do the work. Everyone is welcome in Yellowstone Country, Montana. They are willing to lend a helping hand and listen to your story. Take the time when you’re visiting to go to a local restaurant, cafe, bakery or watering hole. Sit for a bit, listen, ask questions. I think you’ll find a place you didn’t know existed. 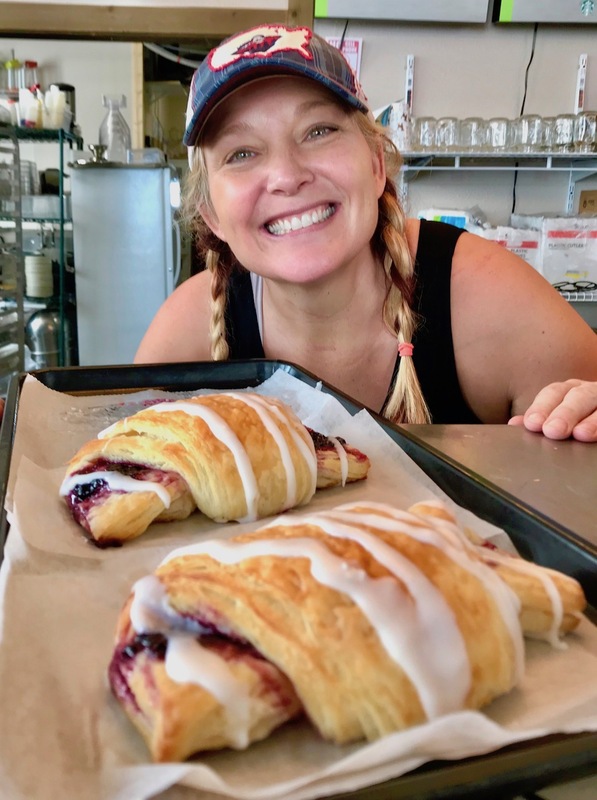 (I’m sorry I had to share these amazing huckleberry turnovers. Consider it a glimpse of tasty treat stories yet to come). 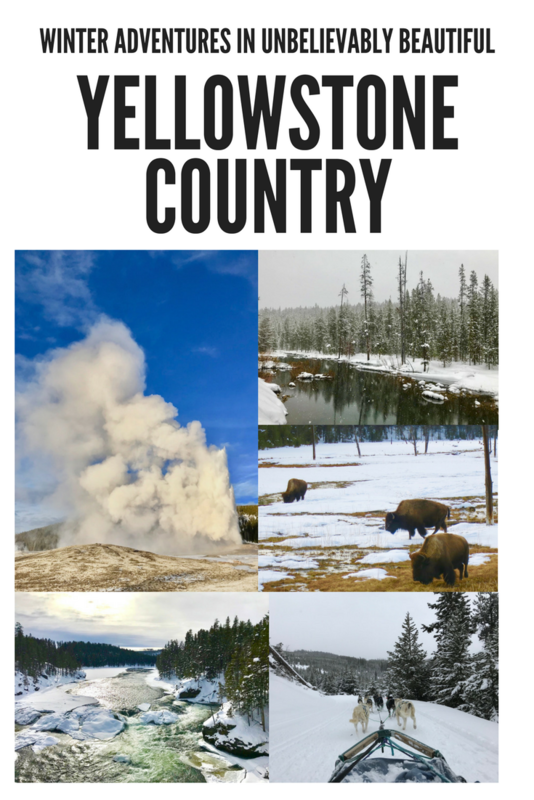 Go to VisitYellowstoneCountry.com for a complete travel planning guide on how to get there, where to stay, and what to do for a winter stay or any other time of the year. They have everything you need to make your visit one that you’ll enjoy to the fullest and remember for the rest of your life. I so want to make there one day, this is my bucket list trip. I have always wanted to go to Yellowstone Park. It really is an amazing place! Winter trips are always so much fun but it doesn’t come with its own set of challenges. 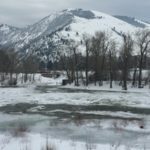 I think your tips are perfect for people who are planning to go to Yellowstone in the winter. It’s really beautiful out there, it will make you appreciate nature more. 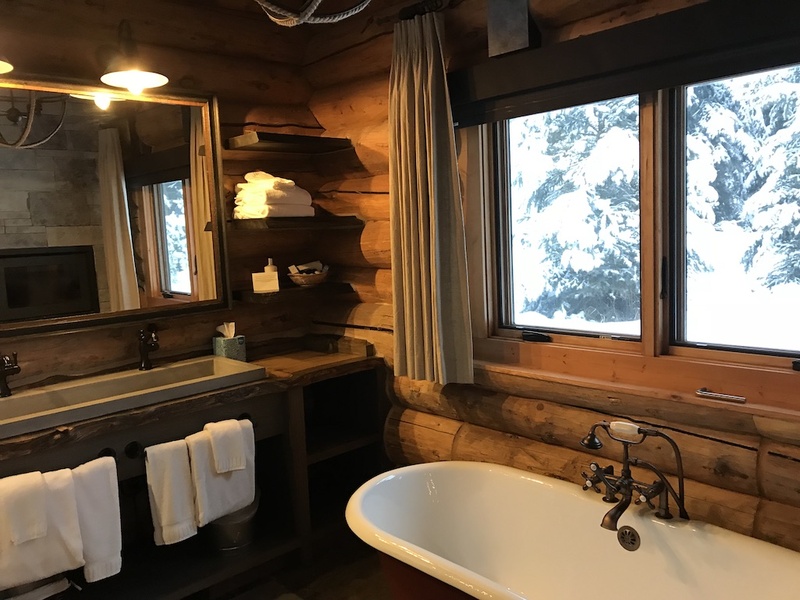 The wolves and the Lone Mountain Ranch Cabin have me sold although everything looks amazing there! I can’t say I have seen many if any photos from Yellowstone in the winter! LOVE it! 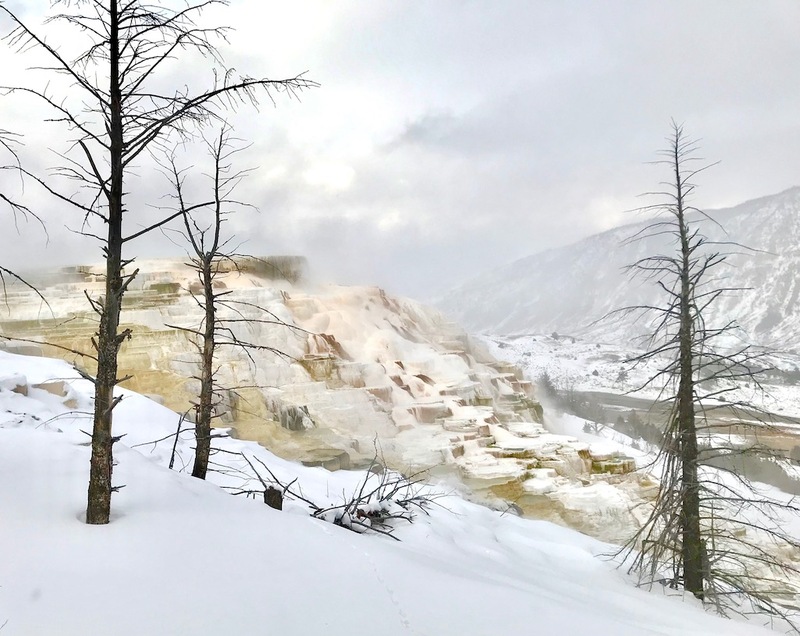 I would so love to visit the Mammoth Hot Springs. A trip like this is definitely something I’d like to add to my bucket list. Looks like you had an incredible time. I would love to go there with my family one day. Yellowstone looks so beautiful in the winter. 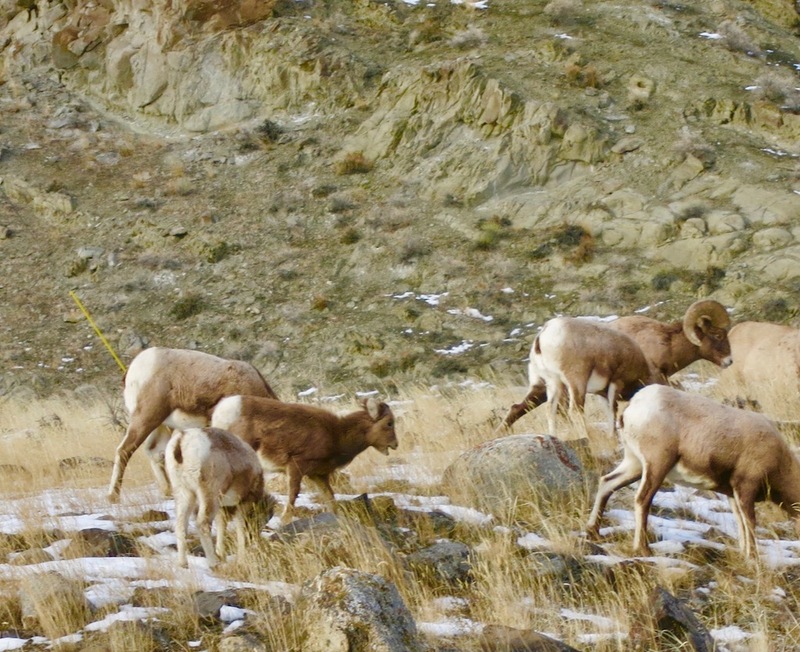 How cool that you got to see those big horned sheep grazing. I love taking photos from places like that. Going to new places are amazing. One of these days I am going to make it a point to visit Yellowstone. I honestly have lived within a few hours of Yellowstone my whole life but I have never been there. It looks so beautiful! Looks like an amazing trip! We’ve only been to Yellowstone in the summer. I totally want to go back after reading your post in the winter. SO many fun activities! I can’t wait to go to Yellowstone! I can’t wait to see the geysers and the Tetons! I live in Colorado so snow doesn’t bother me too much, but I do long for warmer days when I’m in the middle of winter. Looks beautiful! This would be so fun! I get really stir crazy in winter and getting away for a fun trip would be awesome! The views are stunning, and that room looks so cozy! 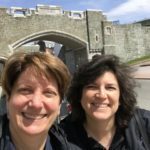 Your pictures are stunning! Looks like a great place to visit! This is such a gorgeous area. I’ve never been to Yellowstone before. One day I might have to check it out with my family! I’d like that cafe! I have never been, this is on our must do list. I would love to take my grandsons to see this. Great pictures!! 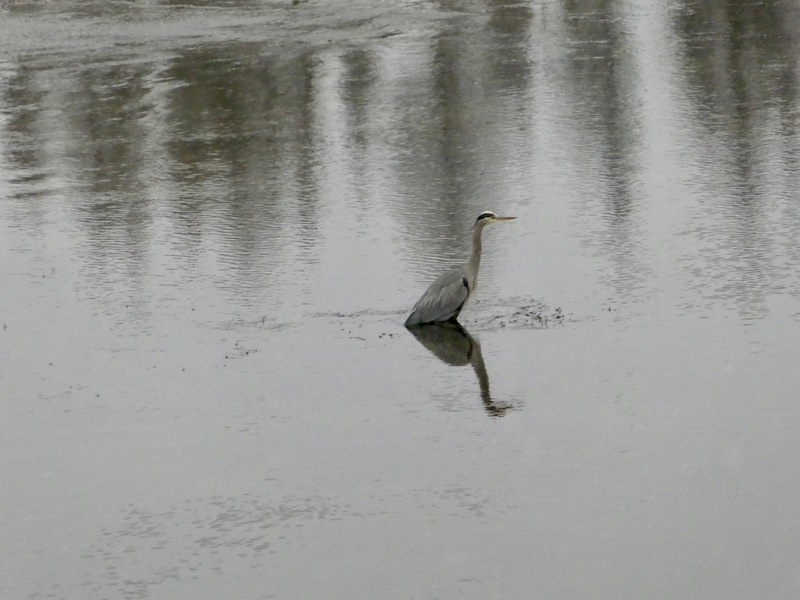 Wonderful to get out and enjoy nature in winter. You picked a beautiful spot. Loved all the photos. I have always wanted to go to Yellowstone! That area of the country is so pretty! I hope to get there sometime soon! Amazing pictures!! It looks like a wonderful adventure! !